How to password protect CD/DVD disc or USB Memory Stick? How to protect DVD/CD or USB Memory Stick by Password? "WellPoint, one of the nation�s largest health insurers, has begun notifying 75,000 members of its Empire Blue Cross and Blue Shield unit in New York that a compact disc holding their vital medical and other personal information had disappeared. The information was on an unencrypted disc that a subcontractor recently sent to Magellan Behavioral Services, a company in Avon, Conn., that specializes in monitoring and coordinating mental health and substance abuse treatments for insurance companies." New York Times. March 14, 2007. 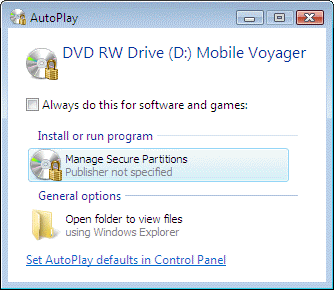 Master Voyager is especially designed to create protected DVD/CD discs and USB Memory Sticks. It creates protected areas on the media and it is needed to enter password to see protected contents. Protected Disc/USB Stick is fully autonomous and does not need any special software installed on computer. Embedded CD/DVD burning module. It supports CDR/CDRW/DVD+-R/DVD+-RW disc types. You do not need to buy special CD burning software. 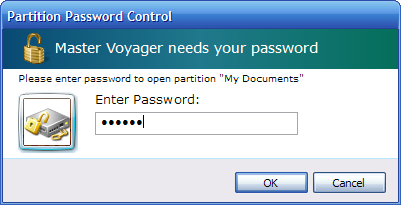 No need to have Master Voyager software on computer to read protected media. Every protected disc/usb stick contains AutoPlay module. You just need to insert disc into CD Drive (or connect your Flash Stick to USB port) and it will ask password to continue. The only requirement is to have Windows Vista/XP/2000 (32 or 64 bit) and CDROM/USB port. The protected media does NOT install any software to the target computer. It is fully autonomous. You do not need to wait until large amount of data will be decrypted to the computer from protected media. Master Voyager utilizes special on-the-fly decryption technology used in our CryptoExpert Professional software. You just enter password and protected areas become visible as virtual hard drives like E:, G:, Z: etc. Just eject disc from CD Drive and all virtual drives will disappear from system. On the fly decryption technology allows to store movies/executable files/audio files inside the protected area. Master Voyager is distributed on the "try before you buy" basis. You can download evaluation version for free of charge. 2. Only fixed password "123" can be used for creating/mounting secure partitions. Registered version has no any limitations. Users of registered version receive new/updated versions for free of charge during lifetime. Click image to purchase registered version.